Known as the ‘Barn House’, this house is almost exactly of the size and shape of a typical agricultural barrel-vaulted barn. The house was designed to take maximum advantage of the views, with a split level layout creating a sense of space in excess of the modest 113 m2 floor area. 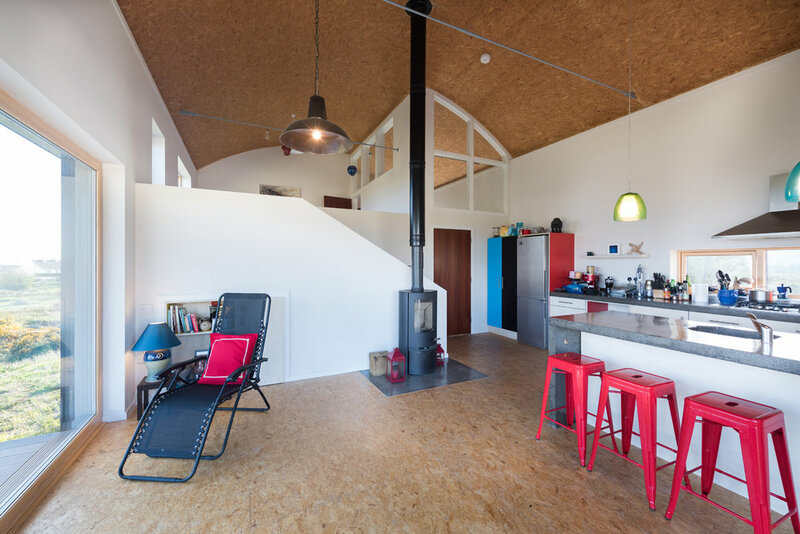 The house is built to passive standard levels of energy efficiency and does not need a conventional heating system. The owner does have an issue on cold days, however, as it is often necessary to go back into the house to get a coat when realising how cold it is outside! Architect: Lester Naughton Architect Ltd.
Access: 2pm to 5pm on SundayOctober 01 2017. Architect-led tour every 30 mins. Booking is recommended otherwise access to tours is available on a first come, first served basis.